“Welcome to Oklahoma. Where 144,000 people are denied health care because Republicans refuse to expand Medicaid.”. That is not right, as many Republicans supported expanding Medicaid and it was Governor Mary Fallin’s decision not to do so. When I called the Governors’ office to protest, I was transferred to someone in the public relations department which may exist in an alternate universe. I did not get the gentleman’s name, but it probably doesn’t matter since he may not exist in reality, so I’ll just call him, Au. I explained to him the reason for my call and ask why the governor had not expanded Medicaid. Au: It was a decision forced upon the Governor by the Affordable Care Act. Me: But the Affordable Care Act allows the Governor to expand Medicaid to cover those people. Au: Yes, but it makes it too expensive. Me: But the federal government will pay for Medicaid expansion for the next 10 years, providing $1.3 billion for the program while costing the state something like $200 million. Au: But the state doesn’t have $200 million, and it could not pay for the expansion in 10 years as then the federal government only pays for 90% after that. Me: But couldn’t the state cancel after 10 years if it found it too expensive. Au: We couldn’t do that and leave all those people uninsured. Note: It was about here that the theme for Twilight Zone began running through my head. Me: Couldn’t we put the money to expand Medicaid into the budget? Me: Couldn’t we forgo the tax cut winding its way through the Legislature – or just raise taxes enough to meet the needs of the Oklahoma citizens? Au: The budget meets the needs of the citizens. Me: Then why is our education system so underfunded? Au: Our education system is not underfunded. Note: It just happened on this particular day there were 25,000 teachers, administrators, parents, grandparents, and students outside the Capitol Building protesting because the legislature would not properly fund education. Me: Then why are all those citizens outside the Capitol Building today protesting educational funding? Au: That’s not what they’re protesting about. Me: Of course it is. The Oklahoma Policy Institute says that the current level of education funding is below what it was in 2008. Au: That’s not true. Oklahoma has actually increased funding for education to an all-time high, over $12,000 per-pupil. Me: That’s not what the Oklahoma Policy Institute says. Where do you get your numbers? That confirmed it for me. Only in an alternate universe would a public relations person hang up on a citizen. In science, however, it takes an independent confirmation before a discovery is credited. Luckily, someone at the Oklahoma Policy Institute also had contact with the alternate universe and was able to retrieve Au’s school budget . A breakdown of his $12,000 per-pupil is shown below, arrived at by including everything but the kitchen sink into the per-pupil expenditures. At the bottom is the Oklahoma Policy Institute’s comment on Au’s budget. 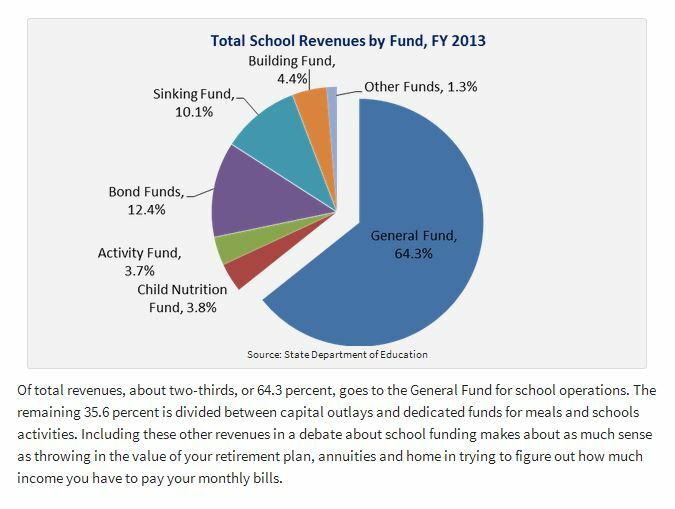 The 64.3% which funds school operation is about $706 less per student in inflation-adjusted dollars than in 2008. Apparently, reality in the alternate universe is very different from the one that most Oklahoma citizens perceive. You too may explore an alternate universe. Just call the Oklahoma Governor’s office about Medicaid expansion. This entry was posted on Saturday, April 5th, 2014 at 12:21 pm	and is filed under Oklahoma Politics. You can follow any responses to this entry through the RSS 2.0 feed. You can leave a response, or trackback from your own site.